Flat Roof Systems can be fitted to all types of flat roofs, from large commercial buildings, to residential flat roofs and garages. They offer great strength and a superb finish, once more they are maintenance free! Using specially formulated resin and fibreglass reinforcement, the Roof Rite G.P.R System is applied to new timber decking. Preformed edges are incorporated into the design and the whole roof is finished with an extremely durable polyester gel coat. 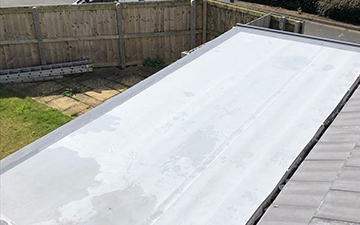 Roof Rite EPDM Roof Systems can be fitted to all types of flat roofs from the large commercial roof to residential flat roofs including garages, extensions, porches, and dormers for a fraction of the cost of continuous replacement. High performance built-up felt roofs.